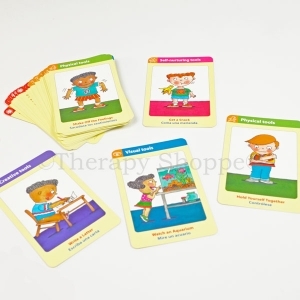 These engaging picture cards are a fun and effective way for kids to learn different self-calming techniques. The illustrated 36-card deck features 24 self-calming tool cards in 6 categories: physical, visual, auditory/verbal, creative, self-nurturing, and humor. On the back of each card there's a child-friendly scenario of the tool, and directions for teaching the strategy (written in both English and Spanish). 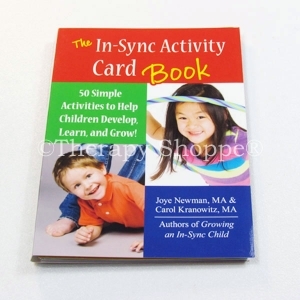 Twelve additional cards provide activities and games that help reinforce learning the calming strategies. 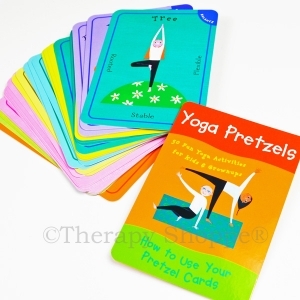 Beautiful quality, 3-1/2" x 5-1/2" cards with colorful kid graphics. 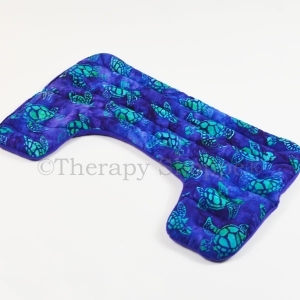 Self-Calming Cards are an excellent sensory diet tool for home, occupational therapy programs, and school classrooms!